Newgate Air Systems would like to thank our hosts at Turn Key Air Conditioning for giving us the opportunity to promote our products and services on their website. With over 15 years experience, Newgate Air Systems design, manufacture and install fume extraction and dust collection systems for companies throughout the UK and in Europe. Over the years Newgate Air Systems has worked with almost every industry to produce clean working conditions and to protect the environment. We have an excellent reputation for efficiency and effectiveness which we worked hard to establish and even harder to maintain. Newgate Air Systems are regularly commissioned to provide background ventilation systems in production facilities. These general extraction systems optimise air exchange from a closed area with clean, fresh air to create a healthier working environment. Point of source extraction systems remove fumes generated by specific industrial processes. 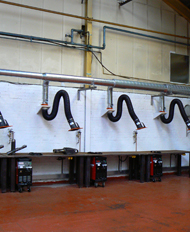 Examples of point of source extractions include welding fume extraction or solder fume extraction where extension arms or fume hoods can be fitted over certain areas or move flexibly between work benches. 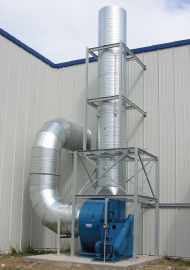 Different working environments demand different fume extraction solutions. At Newgate Air Systems we design, develop, manufacture and install systems that are custom built for each client. Forge and furnace extraction systems must cope with fumes and dust and will often include quench tank extractions. A similar model may be found in casting plant extractions where steam extraction is also a consideration. Milling and grinding machines usually require a combination of fume and oil mist extraction. Newgate Air Systems also has a great deal of experience in laboratory fume extraction, using flexible extraction arms or manufacturing fume cabinets and cupboards for use in the laboratory. Motor vehicle manufacturers or repair centres often require a combination of fume and dust extraction systems. Flexible point of source vehicle emission extraction for car exhausts provides a different set of problems to spray booth fumes and particle extractors. In closed-room facilities, clean air must also be pumped back into the environment at the same time as contaminants are removed. Complying with all health & safety requirements is not just mandatory but makes good business sense. Newgate Air Systems is registered with the Contractors Health & Safety Assessment Scheme (CHAS) and all of our installation teams carry Health & Safety Passports & Skillcards. Safety inductions are conducted for all clients and Method Statements & Risk Assessments are generated for every fume extraction and dust collection installation project we undertake. Newgate Air Systems has an excellent reputation for combined extraction techniques. Many of our larger clients’ manufacturing processes produce a mixture of toxic fumes, gases, particles or other pollutants. Newgate Air Systems welcomes the challenge of developing multi-part extraction techniques. Our clients know they can rely upon on us to design and install an efficient, cost effective clean air solution. Newgate Air Systems are always happy to talk to new or existing customers about their projects, plans and requirements. Further information on our services and products is available at www.newgateair.co.uk.